Miriam’s mom ran beside me through the train station. I told her she could just drop me off, but she wouldn’t hear it. Instead, she jumped out of the car and led the way to make sure I didn’t have any trouble finding the right train. Mom’s are like that, you know, you could walk halfway across a continent and they still want to make sure you catch the right train. I bought a ticket and she waited with me until the train pulled up. I gave her one last hug on the platform and stepped aboard. I waved as the doors closed and the train rumbled back toward the trail. Loneliness washed over me, familiar and sharp, settling into the old cracks it has carved over the last months, finding me unprepared for it, digging a little deeper than before. “Back so soon,” I thought. For three days, I didn’t think about being alone. I had a warm bed. A puppy who burst in to lick my face in the morning. A table to sit and share stories over. An adopted sister, a brother, a mom, a dad. I had a family. I think they would have let me stay as long as I wanted, a week, two, all the way to Christmas maybe, but then I might have forgotten how to start again, like a machine rusted over. Let it sit too long and the engine won’t crank. There’s a momentum to walking across continents. Lose it and risk stopping forever. I slumped against the train window and watched the world slide by. I thought of meeting Miriam that first day, the disbelief that I’d actually made to this distant place I’d heard about five months ago. I thought of cooking spätzle with her mom and dad, of drinking glühwein in the winter market with her brother and friends, of fresh pretzels in the morning with the slice across the thick end like the do in Swabia, of hugs and laughter and warmth. Some places are hard to leave. Maybe the best way to describe Miriam’s family is to describe the dining room table. It’s not a big table, meant for six people, maybe, two on each side and one for each end, but it’s magical. No matter how many sit down, there always seems to be room for one more. Pull up another chair, turn the table sideways to squeeze space out of the room, slide a bit closer together, add another set of silverware. It didn’t matter who arrived, there was always space for boyfriends and girlfriends, for aunts, uncles, and cousins, for friends who dropped by, and for that stranger that Miriam met at Nordkapp. Always a bit more space, a bit more laughter and warmth, old stories and new, a bit more of try this or have another of that, a bit more of are you full and what else can I get you. That’s how it felt, that’s how hard it was to leave. I switched trains in Stuttgart and rumbled west back to Pforzheim, back to where I stopped walking. The trail picked up again from the platform and I followed it south until night fell. The softness of nights spent inside walls made the air feel colder than I remembered. The night soaked over me, scouring a bit of rust off my hinges as the shafts of moonlight filtered through the Black Forest’s canopy. I frowned at cold, stubborn, breath smoking, and I walked on, walking until it was beautiful again. Posted in Europe North to SouthTagged backpacking, ENS, Europe North to South, family, featured, hiking, nice strangers, thru-hikingBookmark the permalink. I could see and feel in my minds eye and heart everything you wrote here….possibly some of your best writing…thanks, Daniel. Great story D! Thank you Miriam and the great Miriam family and friends. Your love is felt across to the Atlantic. Hopefully we can return your generosity some day. The table picture says it all. Daniel: I could not read this post from your website page — read it from the email. Only the picture and the comments are shown in your website. The rest is just black. May want to check with WordPress. It’s black text on a black background again. If you highlight the website, you can see the text as well. Sweet!!!!! What a great big community on the planet!!! Thanks for continuing to remind us all!!! I had to look up Swabian pretzels! What sweet memory you now hold on your heart of such fine people and a family people dream about! Thanks to all for welcoming my son so lovingly to your home and to your lives! Daniel, you have the LARGEST family of any human being I know. You attract only the BEST and they all love you deeply. 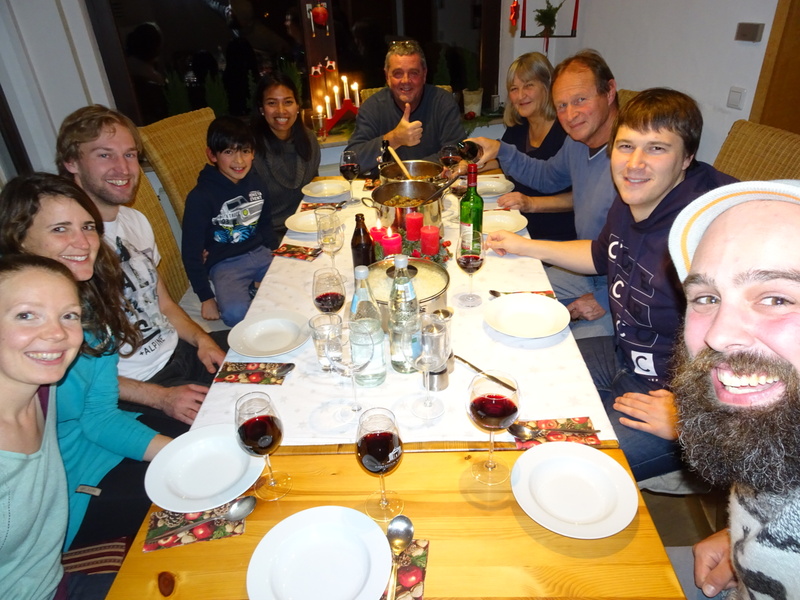 As you described the family, the table, the extra people coming in, and each warmly welcomed as more room was made. I felt as though loaves and fishes were being served with a side of love, miraculous meals which are the glue that bind us to one another, stomach to stomach! You are a voyager in the family of man and we couldn’t have found a better representative. Your heart grows larger with each encounter, each ride you catch, always reaching out for more. THAT’S how we should all live . . . from the HEART! So glad to see glimpses into the beauty you are creating, so honored to know you! Daniel, I note that Deb Bradley is not appearing with my posts – WordPress refuses to let me post as ME, but rather from a blog I intended to write. My apologies for any confusion that may have caused!